Harp seals (Pagophilus groenlandicus) are meat-eating pinnipeds that live in both the Arctic and Atlantic oceans, in frigid waters off of Russia, Norway, Greenland and Canada, to name a few locales. Due to their appearances, harp seals are frequently thought of as having no ears. They do indeed have ears, although they're not visible from the outside. Harp seals are adept at swimming and prefer staying in the water to venturing onto terra firma. They're capable of staying totally underwater for minutes or so. Harp seals tend to reside in coastal areas, on pack ice. These sturdy, pale gray creatures predominantly dine on fish, specifically varieties such as Arctic cod and capelin. The youngsters, however, gravitate to wee invertebrates come feeding time. Amphipods are a particular favorite for youthful harp seals. 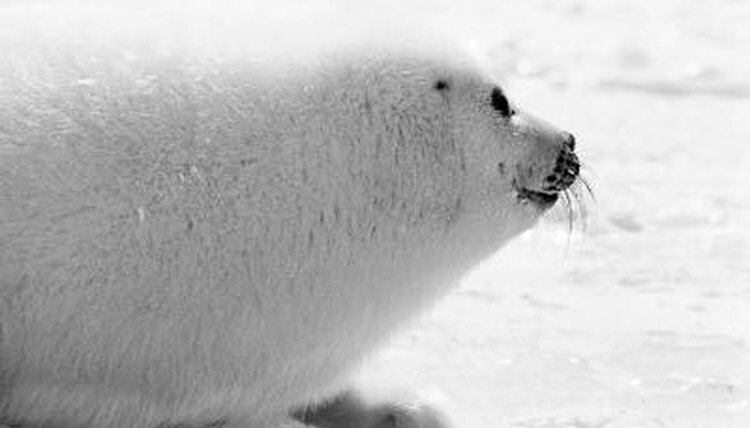 Two other oft-used handles for the species are "saddleback seal" and "Greenland seal." Harp seals typically live for around 20 years. Their primary predators include both polar bears and killer whales. As true seals -- family Phocidae members -- harp seals do not have pinnae, which are the protruding segments of ears. Despite this, their hearing skills are often rather strong, depending on the situation. The insides of their ears also closely resemble those of many of their fellow mammals. Other types of seals without visible ears are harbor seals (Phoca vitulina), Hawaiian monk seals (Monachus schauinslandi) and leopard seals (Hydrurga leptonyx) and an array of others. When harp seals are above water, a couple of factors can negatively affect their aural abilities. These factors include their aforementioned earlessness, along with their particularly lengthy ear canals. These canals are often blocked up by wax, which sometimes diminishes their hearing. Despite all of that, these seals' ears are designed to work both in and out of the water. When harp seals aren't underwater, their hearing isn't too different from that of people, although it might be just a tad less receptive. Harp seals' underwater aural skills are undoubtedly impressive, with scopes of over 60,000 Hz. The harp seal's absence of pinnae is not without a purpose. The absence actually contributes to the seals' abilities to pick up on direction in hearing, which they utilize to their advantage both underwater and above the surface.